After having been launched, a product should enjoy a long and happy life. But each product has a product life cycle (PLC) – the product’s life is not infinite. In order to cover all the effort and risk that went into launching a product, the company wants to earn a decent profit. The company must be aware that the product will not sell forever: it goes through the product life cycle stages. Before discussing the product life cycle stages, it is wise to explain what the product life cycle actually is. The product life cycle (PLC) is the course of a product’s sales and profits over its lifetime. Product Development. When the company finds and develops a new product idea, product development starts. During product development, sales are zero, and the company’s investment costs increase. Introduction. Sales slowly grow as the product is introduced in the market. Profits are still non-existent, because the heavy expenses of the product introduction overweigh sales. Growth. The growth stage is a period of rapid market acceptance and increasing profits. Maturity. In the maturity stage, sales growth slows down because the product has achieved acceptance by most potential buyers. Profits level off or decline because marketing outlays need to be increased to defend the product against competition. Decline. Finally, sales fall off and profits drop. Not all products follow all five stages of the product life cycle. While some products are introduced and die quickly afterwards, others stay in the mature stage for a very long time. Some are cycled back into the growth stage after reaching the decline stage through strong promotion or repositioning. In fact, a well-managed brand could live forever if wise strategies are applied. Examples include Coca-Cola, Gillette, American Express, which still live on after more than 100 years. Not only single products can go through the product life cycle stages. Indeed, the PLC concept can also describe a product class (for instance petrol-powered cars), a product form (e.g. four-wheel drives) or a brand (such as the BMW X5). In each case, the PLC concept applies differently. 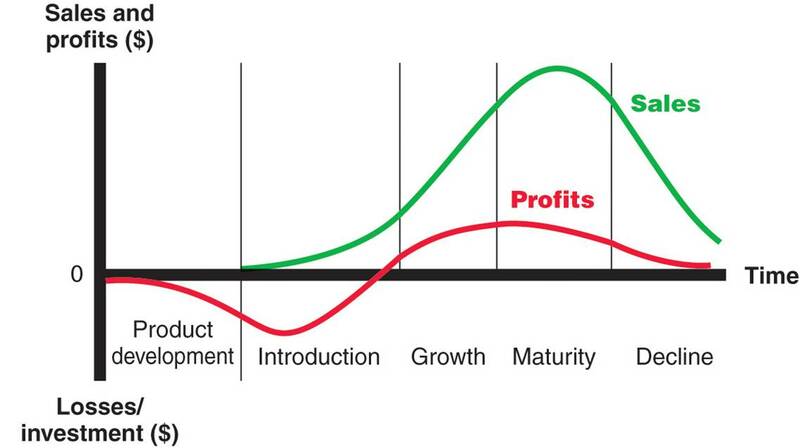 While product classes have the longest life cycles, staying in the maturity stage for a long time, product forms tend to have the standard PLC shape. We can also apply the Product Life Cycle stages to styles, fashion and fads. Their product life cycles are somewhat special. A style is a basic and distinctive mode of expression. For instance, styles appear in homes (e.g. country cottage, functional art deco), clothing (e.g. formal and casual) and art (e.g. realist, surrealist and abstract). A style may last for generations, but usually passes in and out of vogue. Therefore, a style’s product life cycle stages show several periods of renewed interest. A fashion is a currently popular or accepted style in a certain field. For instance, the more formal ‘business attire’ look in the 1980’s gave way to the ‘business casual’ look of the 2000’s. Fashions tend to grow slowly and remain popular for a while, before declining slowly. Fads are temporary periods of unusually high sales driven by consumer enthusiasm and immediate product or brand popularity. A fad may be part of an otherwise normal product life cycle, passing through the product life cycle stages. But at a certain point, sales raise unexpectedly, but drop afterwards equally quickly. The best example is the Rubik’s Cube. The product life cycle stages can be used for describing how products and markets work. When used carefully, the PLC concept can be a great help in developing goods marketing strategies for the different product life cycle stages. However, using the PLC concept for forecasting product performance or developing marketing strategies brings some practical problems. For instance, it is difficult to forecast the sales level at each of the product life cycle stages, as well as the length of each stage and the overall shape of the PLC curve. Also, the marketing strategy is both the cause and the result of the product life cycle. The best option is to use a product’s current position in the product life cycle in order to develop marketing strategies. The resulting strategies will then affect the product’s performance in later product life cycle stages. The idea behind the PLC concept is that companies must continually innovate. Regardless of the success of a company’s current product line-up, it must skilfully manage the product life cycles of existing products for future success. In order to grow, it must develop a steady stream of new products that offer new value to customers.